Black Rhino Game Reserve is strategically located 33 kilometers north of the entrance to Sun City in a Malaria free area adjacent to the prestigious Pilansberg Game Reserve which in turn forms part of one of the most sort after Eco-Tourism destinations in Southern Africa. It is an area frequented by locals and tourists from all over the world - and therefore has the potential to attract a large number of overseas visitors. The Reserve offers a Big Five Game Lodge investment opportunity, approximately 1 hour 30 minutes away from Johannesburg, and 33 kilometers away from all of the facilities of Sun City. It offers nature lovers an alluring combination of rolling hills, graceful valleys, grass land plains covered with pristine Bushveld and Tamboti forests away from the hustle and bustle of the busy city life. Fly to Lanseria or OR Tambo International Airports. Travel along the N4 and take the R510 right to Sun City. 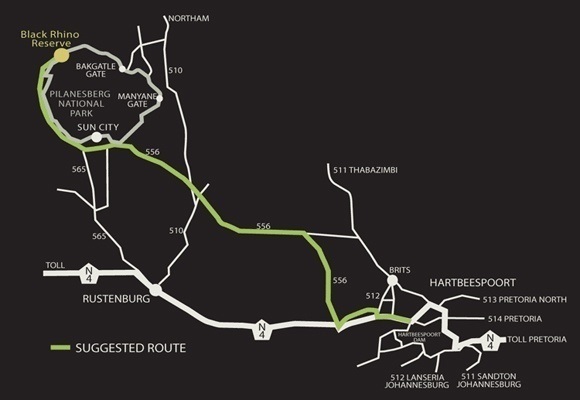 From the gate of Sun City continue traveling in the direction of Rustenburg for approximately 4kms on the R565. At the stop street, turn right and travel approximately 30kms on the Madikwe road where you will find the entrance of Black Rhino Game Reserve on your right hand side. It is a tar road all the way to the entrance. Take the N4 Hi-way to Sun City - This road leads onto the R556. You will pass Sun City on your right hand side. Travel to the 4 way stop and turn right onto the R565. Travel on this road R565 for approximately 28km. Black Rhino Game Lodge is on your Right hand side - marked with a large white board BLACK RHINO GAME RESERVE.